Guide4WDW.com: The Top 5 Things You May Not Know About Tomorrowland! The Top 5 Things You May Not Know About Tomorrowland! 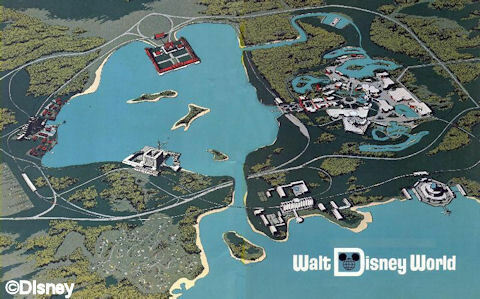 Throughout the development of the Disney theme parks Walt Disney had elaborate and unique ideas that had never truly been developed before. As a result, getting those ideas on paper was a monumental task for multiple artists over the years. Taking the creative ideas and actually physically delivering them in a way that can be understood is an extraordinary task on it’s own, but that’s especially true when something has never been done before. So, what was planned isn't always exactly what became a reality. In the original drawings of Tomorrowland (the original, Disneyland version that is), there were no large wings of attractions to the left and right of the entrance, but rather a large semi-symmetrical design concept, complete with a transportation system of tomorrow. The right wing featured high, rounded, architecture and the left wing continued the pattern with a smaller rounded design. Also, as the land extended back towards what has become the Rocket Tower Plaza, the entire area was covered on each side of the walkway by a large asymmetrical roof that almost mimicked the canopies of large trees supported by rounded beams. Beyond the structural architecture, the area featured “the transportation system of the future.” While we did eventually receive a variation of that system in many parks, this design was similar yet different to modern monorails. Opposed to the current design(s) the artwork portrays a hanging monorail with a pod style “ride vehicle”. While the design is certainly unique and quite innovative, I can assume that the concept never truly would have played out quite the way it was intended to over time. While the design itself has a somewhat general appearance of what Tomorrowland became at multiple parks, it is quite unique to speculate on how one idea in this drawing could have sparked another idea and in turn created what we experience today. 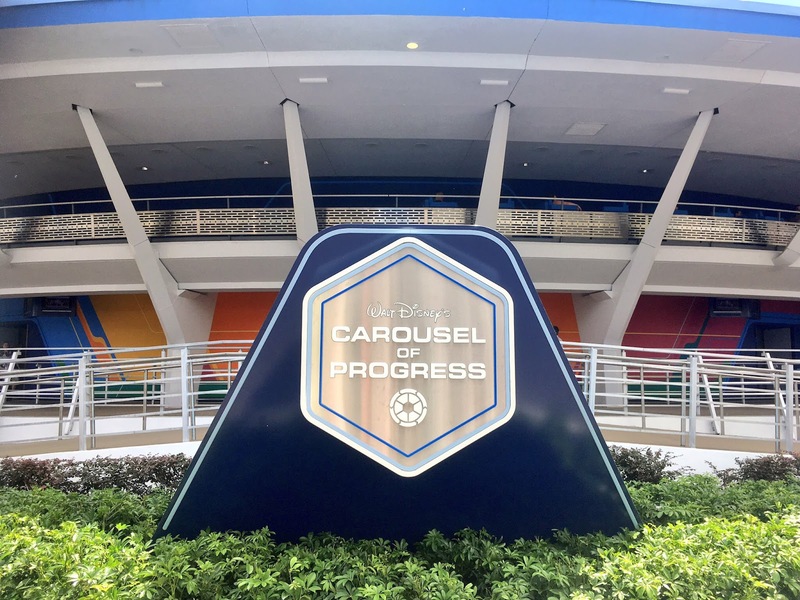 In the early 1960’s Walt Disney created the idea for a “Carousel of Progress.” As many of you may know, the attraction continues operation today at Walt Disney World’s Magic Kingdom. Fortunately that isn't where the story ends. In an effort to get General Electric to sponsor a design and theme of “Progressland" at the 1964 New York World’s Fair Walt Disney created a full-scale concept for an audioanimatronic stage show that would be the first of it’s kind anywhere in the world. However, after storyboarding and approving the design with G.E. an entire scene of the attraction was fully developed in California to prove that it could in fact be completed and fully operational. While today that doesn't necessarily seem like a feat of engineering, to be able to create and replicate a design so original at that time was truly extraordinary in a way that is hard to put into words. They achieved the impossible, and yet were able to replicate it on the largest stage in the world, The World’s Fair! 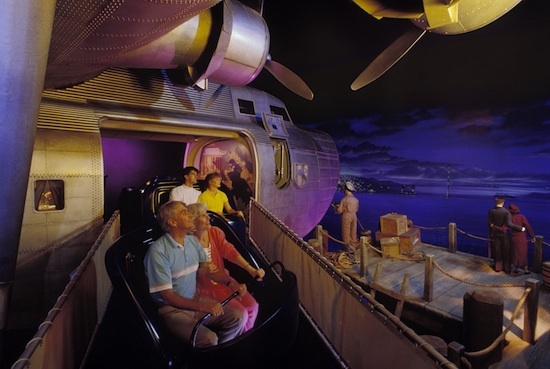 Today, the attraction has stood the ultimate test of time and continues to entertain guests. It has even received a few updates along the way. Most recently, the color scheme has been completely reimagined and it has been accepted widely by Disney enthusiasts. While most of your minds go straight to Space Mountain when you think of space travel in Tomorrowland, there was actually a more “authentic” space travel experience that pre-dated even Space Mountain, Flight to the Moon. Flight to the Moon, which later became Mission to Mars, was an attraction that debuted on December 24, 1971. While the attraction was not ready as a day one attraction, it did pre-date Space Mountain by nearly 4 years. The attraction itself was quite simple, yet it was the first reference to “authentic” space flight in Tomorrowland. The attraction was quite lack luster in it’s simulation of space. As the room remained stationary, video screens and special effects were utilized to replicate a space flight environment. If you take into consideration that this attraction later developed into Alien Encounter and Stitch’s Great Escape, you can imagine how unrealistic the space flight was. Soon after the United States fascination with manned flight to the moon had essentially passed, Disney redeveloped the ride concept and it became Mission to Mars. While it was still just a slight variation of the same attraction, it gave the ride premise some new life for quite a few years. After it finished it’s run in 1993, it was replaced by Alien Encounter which is a somewhat scarier version of the current generation of the location, Stitch’s Great Escape. However, even that location has all but been abandoned with it’s operation now being limited to a seasonal basis. During the development of the plans for what was initially designed to become a Persian Resort, certain conceptual art documents feature a monorail loop that would enter into Tomorrowland. While the route was never developed as a result of the resort essentially being scrapped completely, the idea has never really been forgotten in Disney history the way they probably would have hoped. With the current corporate outlook at Disney to slap a logo or brand on anything, it may not come as a surprise that they’ve been doing this much longer than people realize. While I have some interesting opinions on the branding concept in the parks itself, I’ll leave that story for another time. With that being said, it is unique to look back at how one particular attraction or two if you’re being picky were essentially an advertisement. Don’t get me wrong, these were classic dark rides utilizing the Omnimover ride system, and were essentially very entertaining rides at that point in time. However, the entire design of both variations of the attraction were quite heavily influenced by airline sponsors. If you enjoyed this article, do us a big favor and share it with friends! Want to join the conversation? Be sure to share your thoughts with us down below or on Twitter and Facebook!